'From now on, every time Modi takes a foreign dignitary in his arms, the Indians will remember how he was taken aback when an Indian indulged in hugplomacy,' says Amulya Ganguli. It is known that the political Right has no sense of humour. This void also applies to Fascists and Communists. Since humour encompasses both hilarity and a touch of the comic, including the gentle art of pulling someone's leg in a gathering of friends, it stands for a relaxed atmosphere which is the hallmark of a civilised and cultured society. The tinkle of glasses and a background of soft music are a part of such an ambience. That fascists are not appreciative of an environment of this nature was evident from Joseph Goebbels' threat to draw a gun if and when he heard the word 'culture'. Like the Nazi Reich minister, the Bolshevik dictator, Vladimir Lenin, too, was wary of the beguiling effects of culture and civilisation. Few will disagree with the logic behind the aversion towards melody. Since both Goebbels and Lenin were dead serious about their respective objectives -- a 1,000-year Reich in Germany and a Communist paradise in the Soviet Union -- they could not afford to be distracted by the trappings of civilisation with their emphasis on jollity and togetherness. They had no time, therefore, to let their guard down when the enemy was at the door and had to be eliminated -- the non-Aryans in Germany and the bourgeoisie in the Soviet Union. Is a similar mentality behind Narendra Damodardas Modi's summary rejection of Rahul Gandhi's 'forced hug' -- 'gale padna' as the prime minister said at a public meeting? 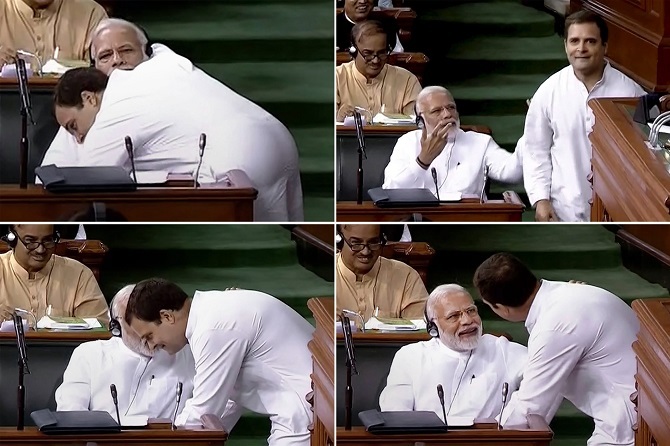 However, the fact that Modi found it necessary to refer to the hug -- which was an off-the-cuff gesture that had nothing to do with the business of Parliament -- at a rally suggests that he has been unable to keep the episode out of his mind. The clinch not only took him by surprise, but was also of a kind which does not come naturally to people on the Right of the political spectrum. The prime minister and his party are also probably unsure of the political impact of the sudden unwanted embrace. Will it succeed in sending out the Congress president's message of his party's preference for love as opposed to the brotherhood's penchant for hate as is evident from the lynchings which have persuaded the highest court in the land to intervene? If the idea of love is aligned to the idea of India during the election campaign, then nearly all of the Sangh Parivar's tricks of the trade -- ghar wapsi, love jihad, harassment of couples on Valentine's Day, the mocking of 'Rome rajya' via a mimicry of Sonia Gandhi's Italian accent -- will lose their sheen. Not surprisingly, the BJP has already wheeled out those who are accusing Rahul of being 'high' on intoxicants. Such snide, below-the-belt innuendo come naturally to the Parivar. That is the only way it can deflect attention from the publicity which the hug has received by depicting it in a lurid light. But the acts of deflection will not be easy given Modi's habit of hugging whoever he meets on his tours as a 'travelling salesman', as the Trinamool Congress's Saugata Roy said in Parliament. The only one who has escaped a cuddle is Xi Jinping notwithstanding the Wuhan camaraderie. From now on, every time Modi takes a foreign dignitary in his arms, the Indians will remember how he was taken aback when an Indian indulged in hugplomacy.